Push notification provider Urban Airship hit an important milestone today, delivering its 5 billionth mobile message. After delivering 1 billion notifications on behalf of its thousands of app developers in a 15-month span, the mobile service provider saw push notification usage increase fivefold in the subsequent 11 months, having delivered another 4 billion messages and alerts since September 2010. The company also hired a CFO. The market is rapidly adopting push notifications as a critical communications channel. A short two years since Urban Airship formally launched, the company has established itself as a leader in its ability to navigate the complex, multifaceted explosive-growth industry of mobile apps. Push notifications—short, real-time alerts sent from within apps direct to users with the app installed on their device—are quickly joining email, social networking and SMS as a critical communications channel. Urban Airship sent the first push notification for any app in the Apple App Store on June 14, 2009. Since then, interest in push notifications has continued to gather steam: the Urban Airship messaging platform powers an average of 520 million push notifications per month, roughly 13,000 messages per minute. Successful brands on mobile are engaging their customers with compelling, relevant information that extends the utility of their app. Several brands, including ESPN, Yahoo, Slate, msnbc.com, dictionary.com, Groupon and LivingSocial use Push to deliver ongoing content such as advertisements, deals and special sales, news stories, podcasts and playlists, weather and traffic alerts, transactional receipts and sports scores. It took the company’s thousands of app developers 472 days (1 year, 3 months, 15 days) to hit the 1 billion notification mark. As context, it took Twitter 3 years, 2 months and 1 day to hit 1 billion tweets. “I'm amazed at the growth we've seen in such a short time. Our team has delivered on the vision of a ubiquitous messaging layer for any connected device and we're just getting warmed up over here,” says Scott Kveton, CEO of Urban Airship. “The market is rapidly adopting push notifications as a critical communications channel. It’s clear that mobile is changing everything." 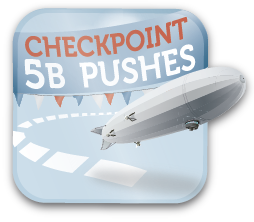 As of August 21, 2011, Urban Airship has delivered 5 billion push notifications. Twenty thousand active iOS, BlackBerry and Android apps run on the Urban Airship mobile platform. Year over year, the number of notifications Urban Airship has delivered increased from 834 million to 5 billion, a 500% growth rate. Urban Airship delivers, on average, 520 million push notifications every month, 130 million per week, 19 million per day, roughly 13 thousand messages per minute. In-App purchase continues to gain momentum. Thus far, Urban Airship has authenticated and enabled more than 4.2 million transactions. The company hits the 5 billion milestone as it embarks on the next phase of its growth. Dylan Anderson is joining the executive team at the company as CFO, VP of Finance and Corporate Secretary. He will oversee strategic growth and help drive capital needs as Urban Airship continues to make traction with significant larger-scale enterprise-scope partners. Anderson, a seasoned start-up veteran, has more than 18 years of financial and operational leadership in early-stage, innovative companies. He brings strong credentials in fund raising, M&A, and both pre- and post-IPO companies. Most recently he was CFO for Max-Viz, Inc., a VC–backed avionics technology company, where he led the finance, legal, HR and administrative teams. Urban Airship powers the world’s most successful mobile apps. Providing breakthrough technology, Urban Airship makes mobile marketing far more engaging, effective, and efficient. Top brands depend on Urban Airship to ensure their mobile app initiatives are scalable and profitable. Verizon, Dictionary.com, Groupon, Yahoo, and Warner Bros. are just a few of the thousands of companies that utilize Urban Airship's innovative platform to reach and engage target audiences and increase app revenue streams through push notification, rich messaging, in-app purchase, subscriptions and data tracking. The venture-backed company was recently named to Fast Company’s list of the most innovative companies and to the Red Herring Top 100 North American Startups. Urban Airship is based in Portland, Oregon.